Did you know that May is Celiac Awareness Month? Van’s is proud to offers lots of gluten-free options in the snacks market that taste great too. In fact, they are kicking off summer with two brand new snack bars (Banana Bread and Gramwich) plus Soft-Baked Whole Grain Granola Clusters in Double Chocolate and Banana Nut. Yum! 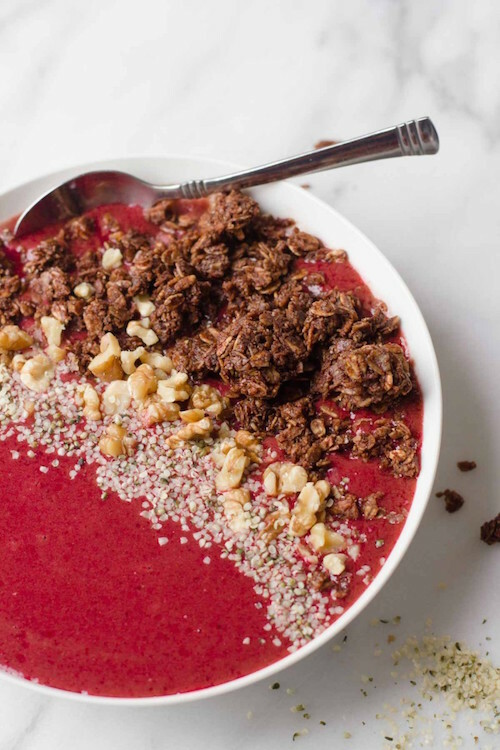 Here’s a delicious new recipe to try out for Cherry Spinach Tart Smoothie Bowls, courtesy of Back to Her Roots on behalf of Van’s Foods. Combine all the smoothie ingredients into a blender, and blend on high until very smooth. You might need to add more liquid, but try to keep it as thick as possible. Pour into a bowl, and then top with toppings. Serve immediately. Kick off summer with two new snack bars (Banana Bread and Gramwich- a chocolate stuffed graham cracker sandwich) and Soft-Baked Whole Grain Granola Clusters in Double Chocolate and Banana Nut. 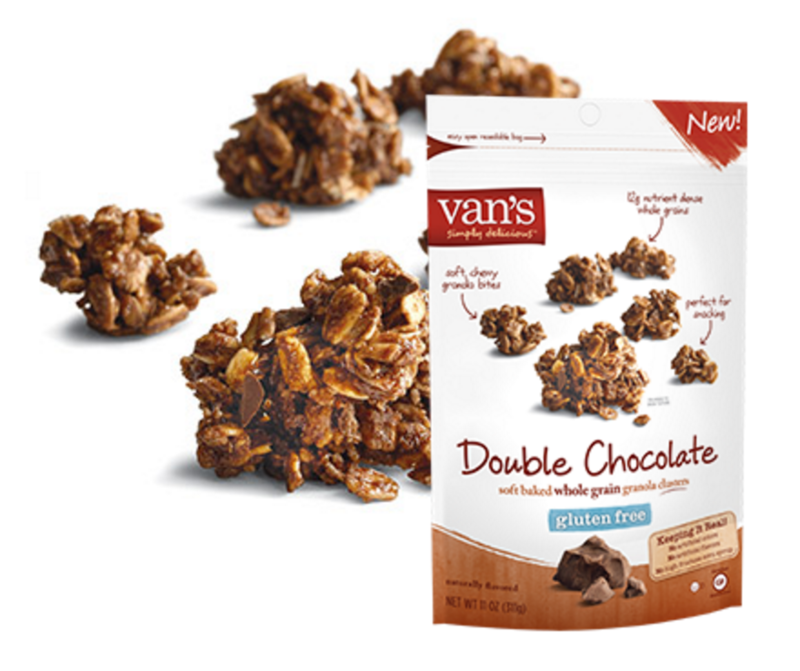 Van’s Double Chocolate and Banana Nut Granola is baked with delicious, gluten-free, whole grain oats and offer 12-14 grams of whole grains per serving – with no artificial colors, flavors or preservatives. 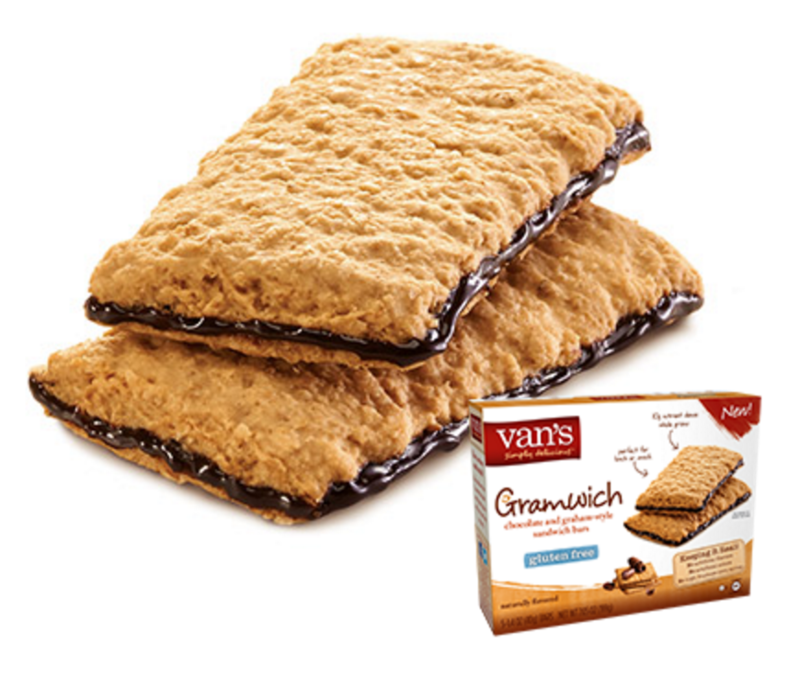 Van’s Chocolate Gramwich Sandwich Bars pack as much favorite-treat nostalgia as they do delicious flavor. Made with real chocolate sandwiched between two whole-grain, graham-style bars, they’re a one-of-a-kind pick-me-up. 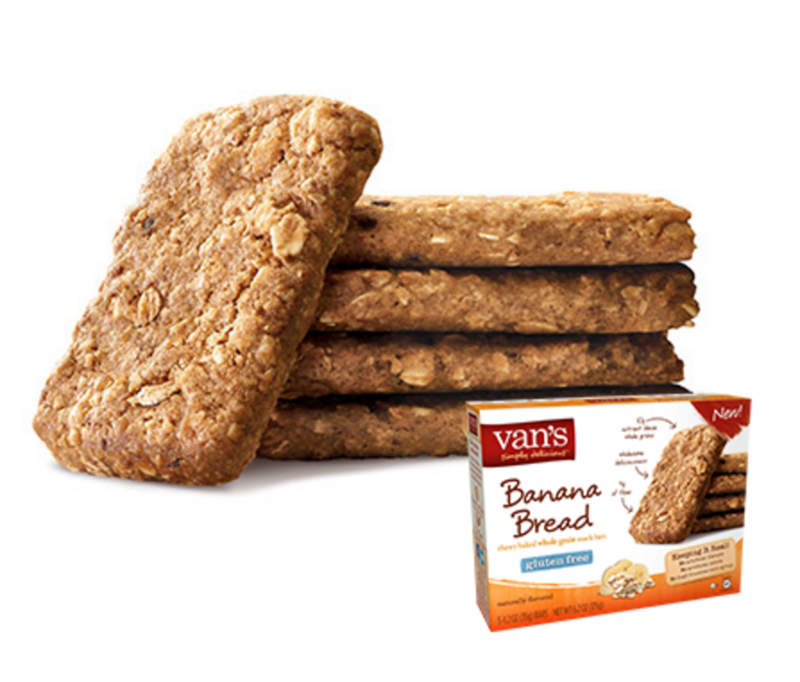 Van’s Banana Bread Bars blend banana flavor with gluten-free oats and flaxseed to create a tasty and portable version of banana bread that’s wholesome enough to enjoy as part of breakfast. Reader Giveaway: One lucky winner will receive a Van’s Foods Prize Pack includig $25 in Van’s coupons, $100 visa gift card, reusable lunch set. To enter, just complete the entry form below. 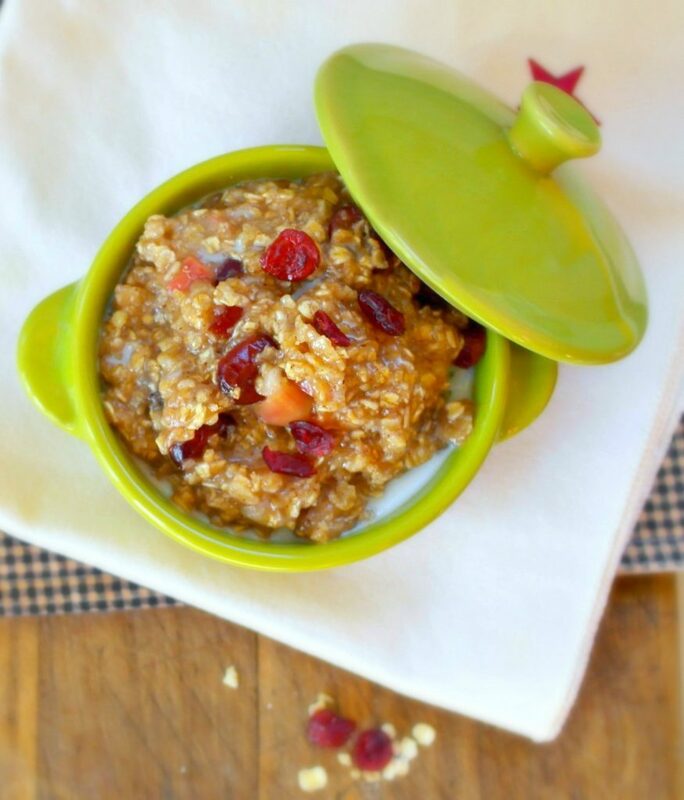 When the cold weather hits, there is nothing I love more for breakfast than oatmeal. 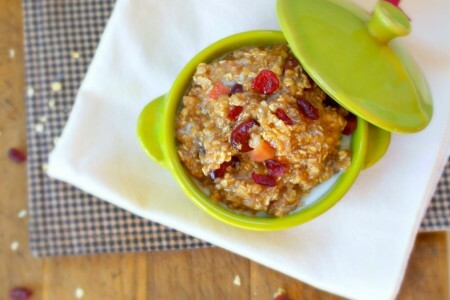 I use to make a basic quick oat with brown sugar, maple syrup and maybe some raisins. It was my go to in the morning. Then one morning I decided to add a spoonful of my homemade applesauce. It was amazing. Just that simple addition took it to a whole new level. I was hooked. Not on the applesauce oatmeal, but on trying new flavors! Next up, this creamy oatmeal that is full of sweet and crunchy , but is also good for you. Cranberries, pecans, cinnamon, nutmeg and of course my not so secret ingredient. 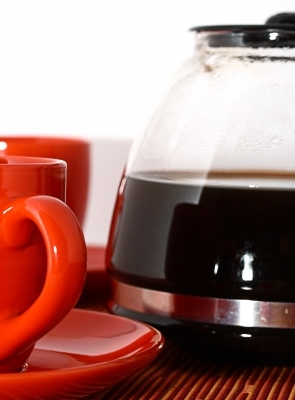 French Vanilla Creamer! I think I bake/cook with my flavored coffee creamers more than I use them in coffee. Try it out and let us know how much you love it. Bring the water, salt and cranberries to a boil on the stove, in a medium sauce pan. Stir in the oats , mix and reduce heat to low. Cook until oats are tender, about 3-5 minutes. Remove from heat. 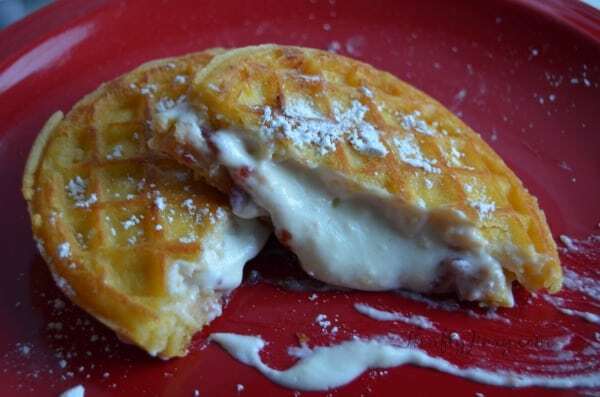 Serve garnished with a dash of the french vanilla creamer. 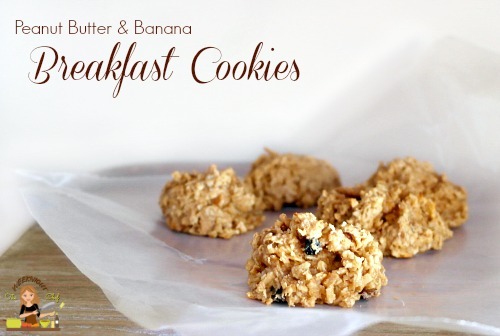 A recent trend growing is using bananas instead of egg and flour in a cookie recipe. I had to try it. I received some amazing oat and granola mixes from MixMyOwn (you can read our review here at Product Review Cafe MixMyOwn Review) I just had to make a breakfast cookie with this mix. 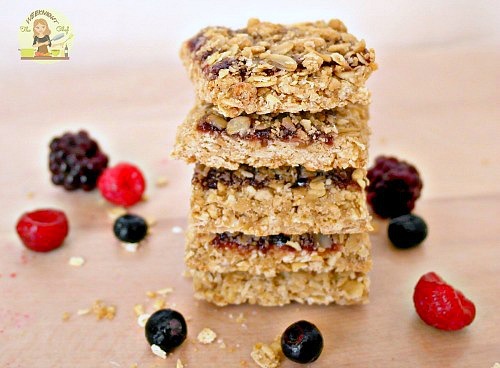 These cookies are packed with fiber, antioxidants and flavor! 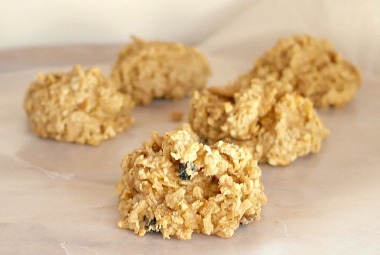 This cookie is kind of a hybrid peanut butter no bake and oatmeal raisin! They are delicious. In a medium bowl, mash the banana, mix in the vanilla. Warm the peanut butter in the microwave slowly, about 20 seconds at a time until thin. Add the oats & baking powder into the bowl, mix. Pour the peanut butter all over, mix well. 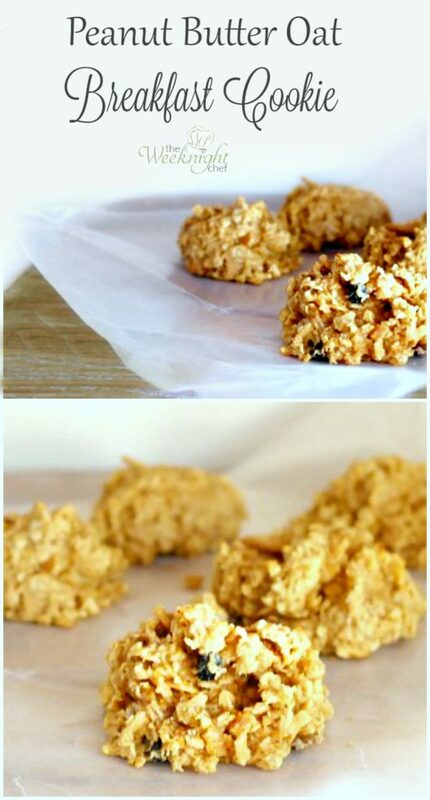 Spoon onto a cookie sheet and bake for 8-10 minutes. There are cacao nibs in the cookies pictured, this was in the mix I used from MixMyOwn. If you wish to add dark chocolate or dried fruit you can! I use to be so scared to bake anything. I was no good at it. Then I decided to skip being scared and just practice. 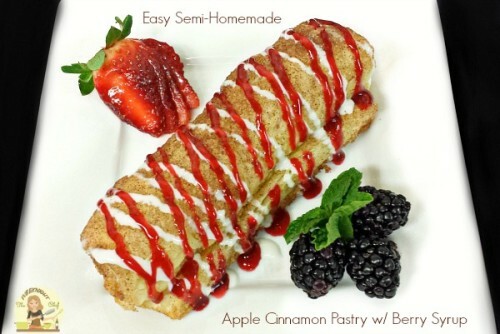 Baking is hard for me because I tend to “eyeball” or “judge” on the amount of an ingredient. 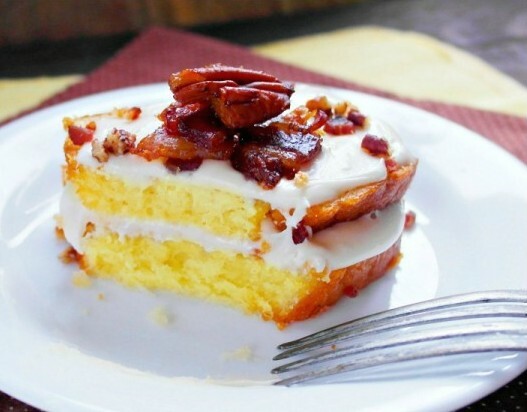 With baking you can not do this. 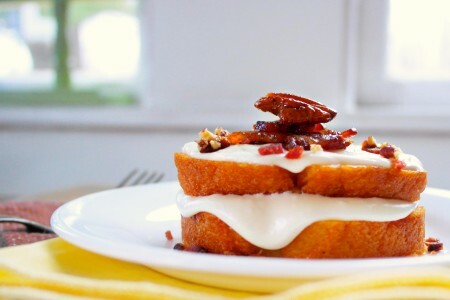 Baking is literally science, not just “a science” like the saying. 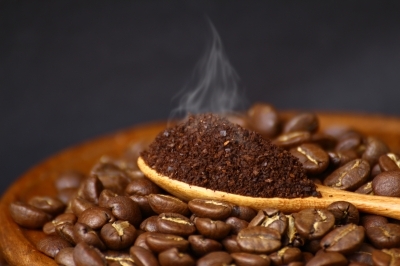 If you are off on one ingredient, another ingredient may not do what it is suppose to. So, don’t be scared to bake, just make sure you follow the recipe exactly. 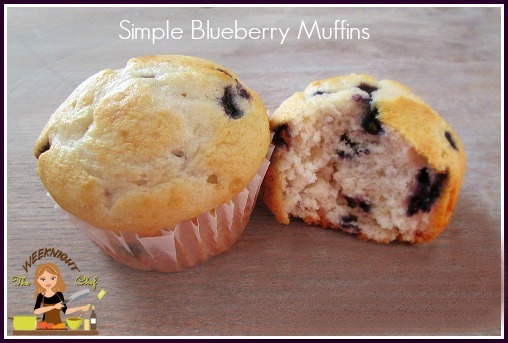 Start with something simple like this easy blueberry muffin recipe. Always use real unsalted butter when a recipe calls for “butter or margarine” . Trust me, it makes a difference. 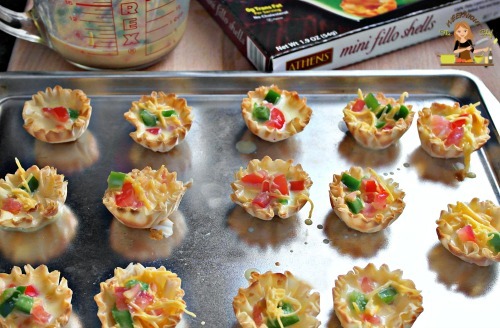 Grease a muffin tin or line with baking cups. Mix milk, 1/2 cup melted butter and egg in medium sized bowl. Add all remaining ingredients except blueberries; mix. Then fold in the blueberries. 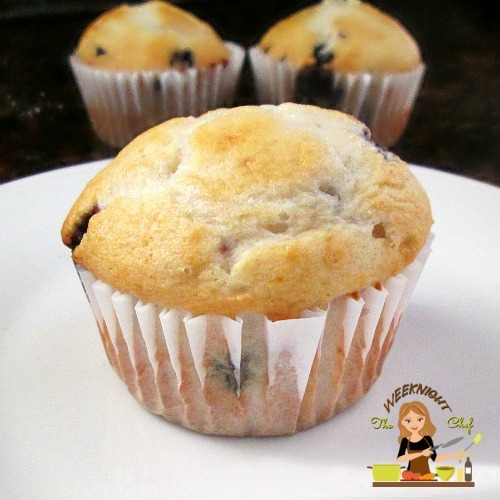 TIP* I use small wild Maine blueberries from Wyman’s. 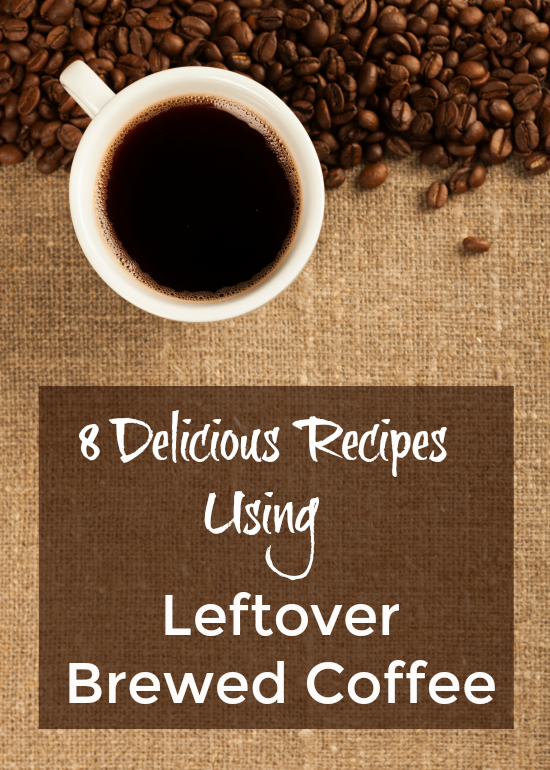 Use can find these in your freezer section. No need to defrost. Just add to a bowl, coat with 2 tablespoons of sugar before adding to muffin batter. Spoon batter evenly into prepared muffin pan cups. Bake 22-26 minutes or until golden brown. Cool slightly; remove from pan. Brush muffins with 1/4 cup melted butter, then in sugar. Optional. 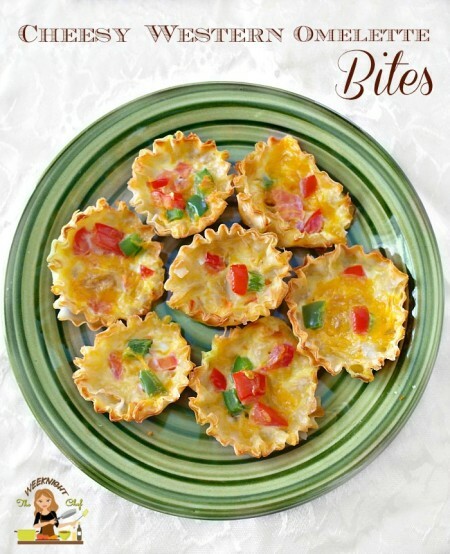 Great as an appetizer, addition to brunch or just a light breakfast, these cheesy western omelette bites are easy and done in fifteen minutes. 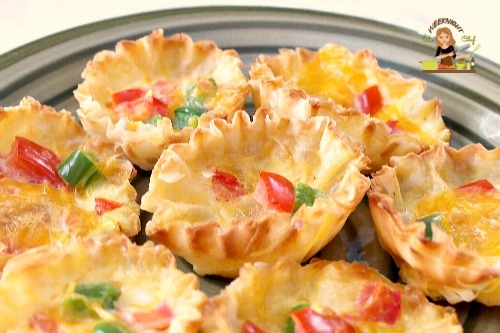 Instead of making a traditional omelette or quiche, the scrambled egg mixture gets poured into cute and crispy little fillo dough cups (phyllo or filo). My favorite is usually spinach and feta cheese, but we decided to change it up and use some peppers. 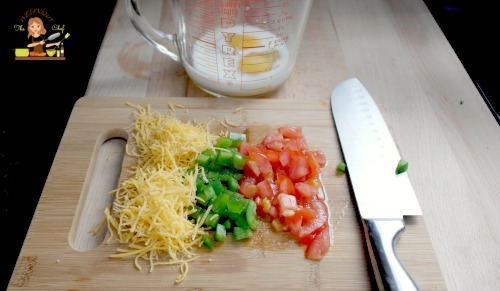 Combine the diced tomato, peppers, and onion into a small bowl with the salt, pepper, cheese and beaten egg/milk mixture. Pour into each shell , you may need to use a fork to guide the veggies and cheese into the cup otherwise just the liquid will pour out. You can fill right to the top. Bake on 350 for 10 minutes or until a toothpick inserted comes out clean. 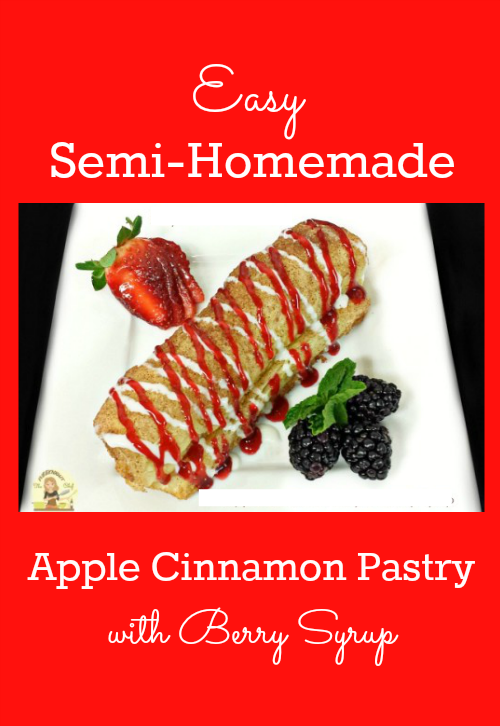 Print or save this recipe! I absolutely love what I call “bars” I eat all different types and flavors. I tend to be crazy busy so it’s easy to just grab a bar and do. I decided to start making my own since, again , it is less expensive. A box of 5 bars usually costs me about $3.50, while that is not crazy expensive it adds up. These Homemade Triple Berry Honey Oat Squares last longer, freeze well and as long as you have most the ingredients already, will cost less to make. Ps- they are good for you, but you would never know it! Bring 3 Cups of frozen mixed berries , 1 Cup of sugar and 2 tablespoons of water to a boil, reduce to medium low. Continue mixing until the berries break down. Remove from the heat and allow to cool completely, if the berries are too thin it will thicken as it cools. 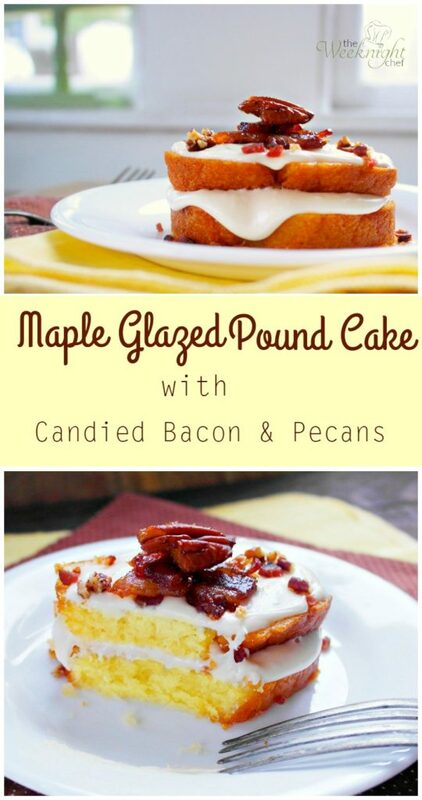 For this next step use a food processor, if you do not have one ( I don’t!) I just do it by hand, it works! Food processor: Add the flour, brown sugar, oats, baking powder, cinnamon, cut butter and salt, Pulse until mixture is crumbly. My hands method: Add the cut butter to the flour, mix using finger tips and breaking apart the butter as you go. Add the rest of the ingredients and continue mixing by hand until the mixture is blended and crumbly. 4. Spread half the oat mix into the pan, press firmly to form a bottom crust. 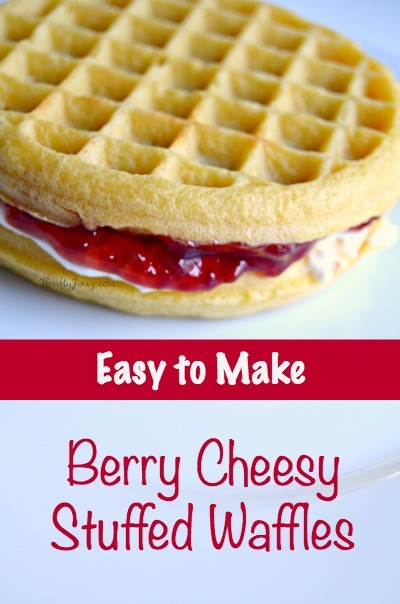 Drizzle the honey evenly all over. 5. Spoon berries (or preserves) evenly on top. Spread the other half of the oat mixture over the top, lightly press down. 6. Bake about 30 minutes or until golden brown. Let cool completely before cutting. Makes about 24-32 squares depending on size. Enjoy!